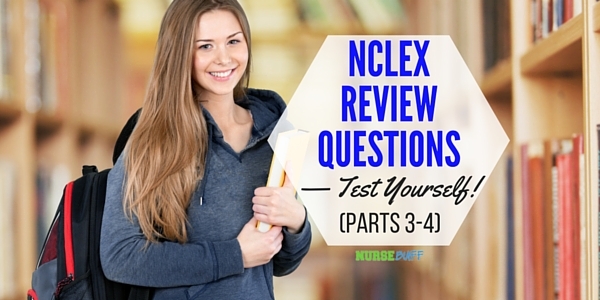 This is part 3 of the NCLEX review questions that can serve as a reviewer for nurses planning to take the NCLEX examination. 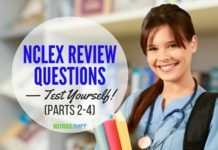 This is another multiple-choice type of questions consisting of 25-items that tests your knowledge on the basic topics in nursing such as Medical-Surgical, Fundamentals of Nursing and Pediatric Nursing. 1. The client is receiving cryotheraphy for repair of a detached retina. Which of the following symptoms should the nurse EXPECT the client to have? 2. The client with a detached retina asked the nurse what may have contributed to its development. Which of the following demonstrates that the nurse understands the predisposing factors of retinal detachment? b. During an acute attack, the client’s room should be brightly lit and the side rails must be raised to provide safety. 6. The client presented with complaints of bruises in the arms and elbow after a vehicular accident. CT scan reveals a contusion in the upper left portion of the head. What is the first nursing action? 8. The client is scheduled for cholecystectomy due to the presence of multiple gallstones. The nurse is taking the client’s past medical history and associated risk factors. Which of the following is a relevant risk factor for the development of gallstones? 10. 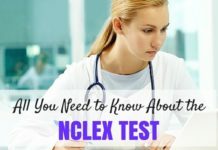 The nurse is assessing a client with a hematologic disorder. 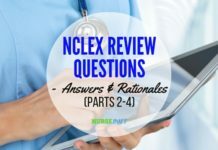 Which of the following nursing assessments is relevant to hematologic conditions? 11. The client presented with complaints of sudden onset of chest pain which is described as sharp and continuous. The pain is reportedly increasing especially during inhalation and friction rub is positive. 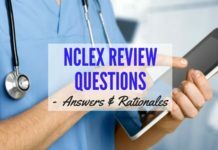 Which of the following is an appropriate nursing action? 12. The client had just undergone intra-aortic balloon pump (IABP) counterpulsation to reduce the workload of ventricles and improve coronary perfusion. 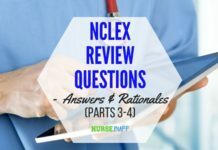 Which is an important nursing action when the catheter is in place ? c. Preoxygenate the client with 100% oxygen for 30 seconds with at least two hyperinflations. d. While applying suction, quickly insert the suction catheter until resistance is met. a. Resonance is low pitch, moderate to loud intensity, hollow and has long duration. b. Hyperresonance is higher than resonance in pitch, very loud intensity, booming and longer than resonance in duration. c. Flatness is low pitch, loud intensity, extremely dull, and short duration. d. Dullness is low pitch, medium intensity, thud-like and moderate duration. e. Tymphany is high pitch, loud intensity, musical or drum like and short duration. f. Dullness is the characteristic of the normal lung tissue. 17. The client verbalized feelings of frustration about abnormal blood pressure and subsequent intake of medications. 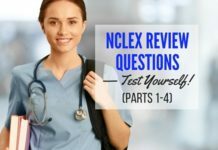 The nurse tells the client: “You are frustrated and upset…” The comment of the nurse is reflective of which interview technique? 18. The nurse on duty is gathering data from the client. Which phase in the nursing process involves problem identification and analysis of objective and subjective data? 19. The nurse conducted initial assessment to the client and noted a compromised airway. The nurse performed a head tilt-chin lift maneuver as an immediate measure for a patent airway. The nurse should be aware that the head tilt-chin lift maneuver is contraindicated in what condition? 22. The nurse is caring for the newborn with a Hemolytic Disease. Which of the following assessment is manifested in this disease? Select all that apply. b. Increased WBC count in CBC result. e. There is a decreased hematocrit level. 23. The nurse is caring for the pediatric client. Upon reviewing the chart, the nurse noted that the client’s age is 7 months. Which of the following growth and development milestones is normal for this age? Select all that apply. a. The infant can sit for a short period of time. b. The infant can grasp a toy with a hand. c. The infant can stand erectly with support. d. The infant can vocalize 1 or 2 words. e. The infant can crawl well at this age. f. The 7 month old infant can bring hands together. 25. The nurse is assessing a healthy term neonate post spontaneous delivery. Which of the following parameters are normal? Select all that apply. a. The newborn’s head circumference is 37 cm. c. The anterior fontanel moderately bulges when the infant is crying. d. Presence of tiny, white, pinpoint papules on the nose and cheeks. e. Bluish gray pigmentation found over the buttocks area. 26. Assessing the neonate includes the different fontanels. Which of the following statements is TRUE about the anterior fontanel? Select all that apply. a. The anterior fontanel is diamond in shape and measures approximately 2.5-4cm. b. The anterior fontanel closes between 8-12 weeks of the newborn’s life. c. The anterior fontanel is not easily palpated. d. Sustained bulging of the fontanel indicates increased intracranial pressure. e. Anterior fontanel is triangular and measures 0.5-1cm. f. Depression of the anterior fontanel indicates dehydration.